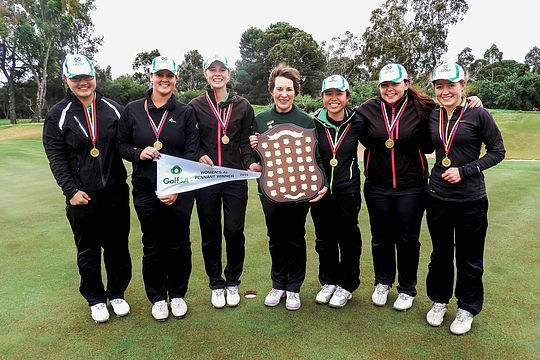 The Grange has claimed its fifth Golf SA Women’s A1 Pennant title and first flag since 2004 by defeating Glenelg 3½-1½ at Kooyonga Golf Club in Adelaide. Glenelg was first to get the points on the board with a solid win to former Tasmania State Player Sarah Crocker, 3&1, over Jean-Wei Foo at number five. The final was quickly returned to balance when The Grange’s number 4, Kristalle Blum, started strongly to be 4up through nine holes against Josie Hodge and continued that form to win 5&3 to square the ledger. Cassidy Evreniadis in her match with Jill Hodge was also 4up through 9 holes and gained another point for The Grange going on to win 5&3, giving her side a 2-1 lead in the five match final. The top two matches were tightly fought out. Caitlin Roberts and Glenelg’s Sophie James were square through 9 and at number 1, Ella Adams was 2up against Glenelg’s Elysia Yap giving her side a slight advantage. After losing at number 2 by Yap in the last year’s final, 7&5, Adams reversed the result to win 4&3 showing how far the 16 year-old has improved in the past 12 months. With Grange having claimed the three matches required to win the title, the number two contest still in progress between Caitlin Roberts and Sophie James, which was square on the 16th, ceased resulting in halves. “The girls worked really hard and it’s been a long time coming, it’s been 11 years since Grange won the Ladies A1 Pennant and I’m really proud of all the girls, they played beautifully”, said Grange Team Manager Belinda Singleton.